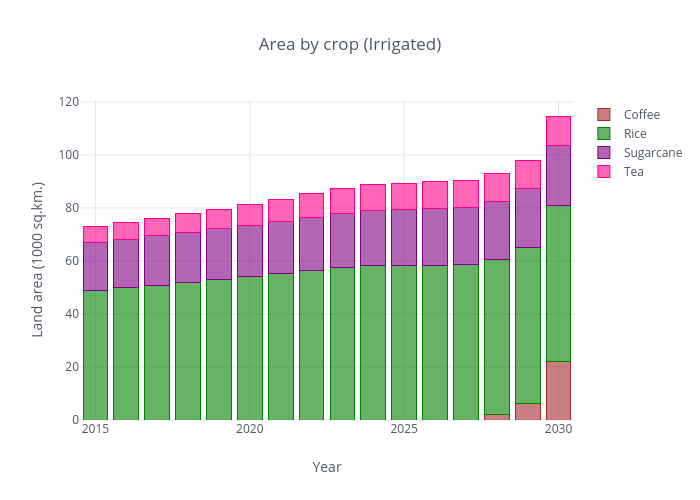 Vinagis's interactive graph and data of "Area by crop (Irrigated)" is a stacked bar chart, showing Coffee, Rice, Sugarcane, Tea; with Year in the x-axis and Land area (1000 sq.km.) in the y-axis.. The x-axis shows values from 2014.5 to 2030.5. The y-axis shows values from 0 to 120.71011294736844.